Looking for a solution to money challenges? Deep in your mind your past history is directing all of your current thoughts and actions related to your financial situation. The lasting solution to money challenges is to re-program your mind to SUPPORT your goals. Fail to re-program your mind, and we just get more of the same financial challenges you are wrestling with today. Here are some brainwave tools to get you centered. The “Manfesting Money (formerly Money Mind Power)” brainwave collection includes the below four unique brainwave training downloadable MP3 audios specially engineered by Dr. Jill Ammon-Wexler, 45-year brain/mind researcher and pioneer mind power trainer. Audio 1. Increase your SMR. Beta SMR (sensorimotor response waves) brainwaves are a specific band of 12-15 cps. Low SMR causes low focused attention that look a lot like attention deficit disorder. Increasing your Beta/SMR brainwaves produces relaxed focus and improved attentive abilities. It also improves your sleep and boosts your energy for the rest of the day. You can use the *Coffee ‘n Blues* MP3 in this collection to instantly achieve this. Audio 2.Bridge the Schumann Frequency. The Schumann Resonance frequency bridges your conscious mind, subconscious and your super conscious mind. Many people do not have active brainwaves in this frequency, and as a result do not remember their dreams and have little awareness of their intuition and early memories. You can use the *Deepened Mental Focus* MP3 in this collection to achieve extraordinary mental conditions. This 10 minute binaural beat training centers in the central Schumann Resonance duplicating the Earth’s primary brainwave of 7.83 cps Theta. Audio 3. Build Money Mind Power. The 10 minute *Money Mind Power* MP3 in this collection has unique brain sharpening and IQ building effects. It builds the focused mind power that fuels prosperous thoughts and actions. The training is based on Dr. Ammon-Wexler’s 45+ years of EEG research with prosperous people from all walks of life from literally around the world. Audio 4. Ease Your Stress. Could you use a natural stress-buster and an uplifting break during the day. If you have the *Money Mind Power* audio collection, then you will love the *Walk in the Park* MP3 in this collection. 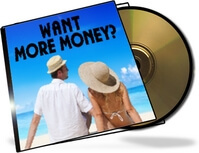 This 10 minute audio is a free gift to buyers of the Money Mind Power MP3 collection, and is an instant solution to the stress many people are feeling around financial issues today. This engineered interwoven peaceful natural sounds of water, birds, and wind chimes directly creates healthy Alpha brainwaves. It is best with closed eyes, but can be listed to in a moving vehicle with open eyes to calm traffic stress. Note: This audio collection is designed to support an ebook — “Money Mind Power ( formerly Manifesting Money. )” If you do not yet have this popular ebook, you can get it here=> Click Here!